NSA.gov down: National Security Agency website hacked in protest? NSA.gov appeared to be inoperative as of early Friday evening. Update, Oct. 26, 2013: The NSA says its hourslong website outage Friday was due to an internal error during a scheduled update, not a denial-of-service attack by hackers, the Associated Press reports. If that’s true, perhaps the NSA could use a “tech surge” as well. 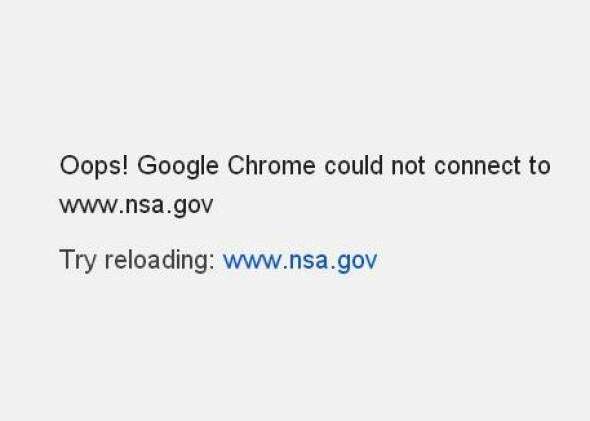 Original story: As of about 5:45 p.m. Friday, the National Security Agency’s website appeared to be down. Russia Today was quick to speculate that the outage was the result of a distributed denial-of-service (DDoS) attack, and it mentioned the hacker collective Anonymous. But RT.com is not known as the most reliable of sources. And the main Anonymous Twitter accounts do not appear to have claimed responsibiltiy for the outage so far. Before anyone panics about an incipient global cyber-war, it’s worth keeping in mind that taking down a public-facing website is not the same as actually infiltrating an organization, as this classic XKCD comic reminds us.